Hundreds of people have clashed with Turkish police in Istanbul during a protest against the rising number of refugees from Syria. Businesses were attacked, windows broken and a car overturned in the western suburb of Ikitelli, on the European side of the city. Youths shouted anti-Syrian slogans and Turkish media said five people were taken to hospital. As many as 1.2 million Syrians have gone to Turkey to escape the civil war. Riot police moved in to halt the unrest on Sunday evening. An estimated 300 people were said to have taken in the violence, some of them armed with sticks and knives. The large number of Syrian refugees in Turkey has heightened tensions in some cities, particularly in the east. 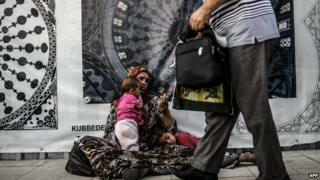 But Syrian refugees are very visible in Istanbul, Turkey's biggest cities, and many resort to begging. The UN says it has 822,000 refugees registered in Turkey although the government in Ankara says the number is far higher. Many have fled to Gaziantep, 100km (62 miles) from the northern Syrian city of Aleppo. Clashes there earlier this month were prompted by the murder of a Turkish landlord by a refugee, reports say. After the violence, the authorities said they would move the refugees out of the city to tent cities.